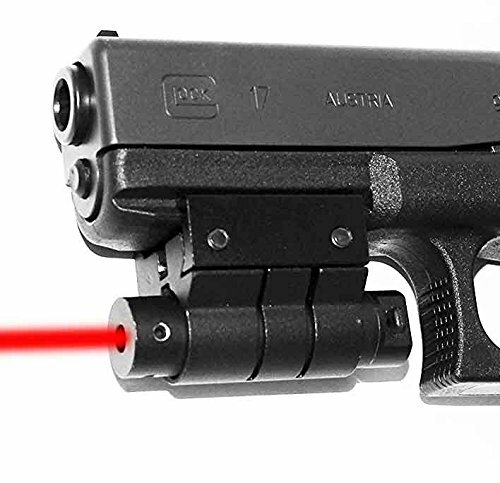 TRINITY Red laser features: Weaver Mount will easily clamp onto Handguns that have a Weaver Style Accessory Rail Under the Barrel. Fully adjustable for Windage and Elevation On/Off Rear Cap Switch is easily turned On or Off with your trigger finger All Aluminum Construction 635-655nm Red Laser Beam <5mw Specially designed Weaver style mount Standard on/off cap switch Includes 3 AG13 Lithium type batteries and mounting tool Dimensions (inches): 1.61Lx1.04 Wx1.19H Weight: 1.2oz. with batteries. Fast Shipping with Tracking Number. Brand New. No Hassle Return Policy. Weaver Mount will easily clamp onto HANDGUNS that have a Weaver Style Accessory Rail Under the Barrel.